Fried Herring with mashed potatoes is a typical Swedish dish and something most locals have been served for lunch in school. Fried in butter and traditionally served with mashed potatoes, garnished with a pinch of parsley or on a piece of knäckebröd, the Swedish hard bread that never goes stale, fried herring offers a meal rich in omega-3 fat, and with enough carbohydrates and calories to fuel long walks discovering the city. Although the dish was traditionally a “poor man’s choice”, herring being found in abundance in the Baltic, today one may find it in fancy restaurants as well. My favorite spot where to enjoy this Swedish traditional fare, is from the herring cart on Slussen. Come rain, hail, snow or shining sunshine, the herring is fried here and served with a choice of different side orders. You can even have it between two slices of bun, the herring burger, although personally I’m a conservative when it comes to herring and prefer it with mashed potatoes, seasoned cucumber, red onion, dill and mayonnaise sauce. 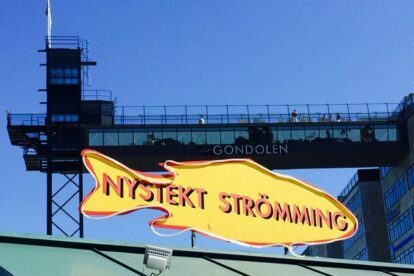 A classic Stockholm experience and affordable.